Historically, erectile dysfunction (ED), as all sexual dysfunctions, has been relegated to a lower priority in a busy primary care practice. However, it is becoming evident that ED will not only accompany disease states of high comorbidity, but also can serve as an early marker for some patients presenting without established cardiovascular disease. 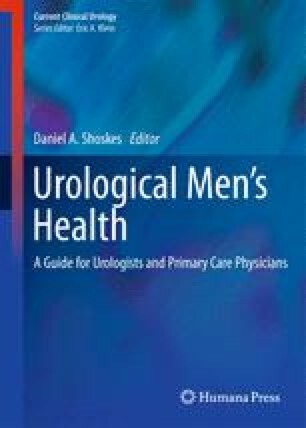 What follows is an examination of trends of sexual inquiry in primary care practice and why asking about erectile dysfunction should be vital; how to engage a patient to allow for such a discussion; the workup, treatment, and determination of organic erectile dysfunction; how to manage the nonresponder to PDE5i therapy; and when to refer. It is the hope of the authors that sexual inquiry can become standard in primary care practice. The number of men with ED is increasing by the decade, and it is vital to propose both a workup and a treatment plan, that is, not only simple but also includes basic lifestyle changes that address diet and exercise. The chapter will include the optimization of PDE5i therapy, and will review other pharmacologic and surgical therapies.